The piano was an extremely versatile instrument, for the first time musicians could produce music with a wide range of tone as well as volume. Initially the preserve of the middle classes, with the introduction of hire purchase even some of the working classes could afford to purchase one. As the piano became more widespread there was a great demand for sheet music that the whole family could enjoy. 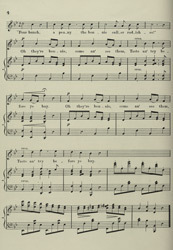 Songs with beautiful lyrics, like this one were also popular, as mini concerts could be held for friends and family.